Are you STRUGGLING in launching or... GROWING your Real Estate Wholesaling business? Are you having a difficult time generating motivated sellers, qualified buyers and partners for your business? Is your dream to build an empire to sustainable heights heading down the drains? PLUS BONUS "Empire Lifestyle Secrets"
...and he is giving away a limited amount of both books for a limited time for FREE. 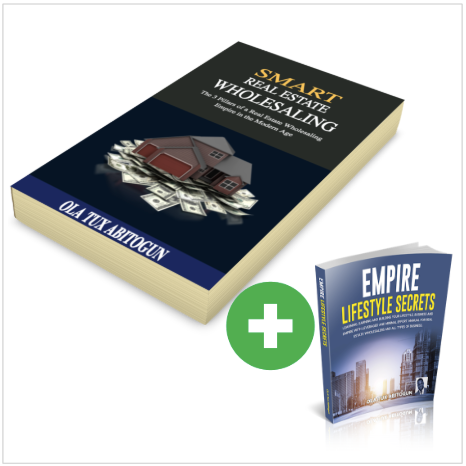 Would you like the secrets of learning, earning and building your lifestyle, business and real estate wholesaling empire simultaneously with leveraged and minimal effort? This book is your gateway to 10X and may be even 100X your business and income using attraction. Smart Real Estate Wholesaling also serves as a manual for manual for all types of businesses, aspiring and experienced entrepreneurs. In addition to the free download of this 200+ pages book, I will also give you access to a free bonus and an optional million dollar mastermind. If you don’t want the mastermind, simply tell us your email address and the book will be instantly sent to you. CLICK HERE SUBSCRIBEFOR INSTANT NOTIFICATIONON NEW VIDEO UPLOADS The post “Smart Real Estate Wholesaling” Video Series appeared first on myEmpirePRO. In this video, I describe in details... how does wholesaling real estate work and how to navigate it in a very simple way in the digital age. We also address a few questions posted by wholesaling real estate scholars. Enjoy the video. The post HOW DOES WHOLESALING REAL ESTATE WORK❓ appeared first on myEmpirePRO.